#1. Billy McShepard (6'10''-F-87, graduated '11, plays pro in Israel) could not help Elitzur Ironi Ashkelon (7-11) in their last game. Despite his very good performance Elitzur Ironi Ashkelon was edged 84-82 on the road by the higher-ranked (#7) Ramat Gan. 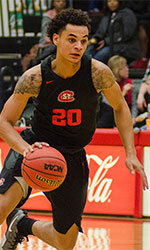 McShepard had a double-double by scoring 22 points and getting 10 rebounds in 37 minutes. McShepard has individually a very good year with high stats. He averages 19.5ppg, 10.4rpg, 2.9apg and 1.6spg in 14 games he played so far. #2. Chris Longoria (6'4''-G-92, graduated '16, plays in Germany) was not able to help Recklinghausen (10-2) in their last game on Saturday. Despite Longoria's very good performance the second-placed Recklinghausen (10-2) was crushed 97-76 on the opponent's court by the leading Duesseldorf in the West group. He was the top scorer with 20 points. Longoria also added 5 rebounds and dished 4 assists. It's Longoria's first season with the team. This year he has very high stats. Longoria averages 20.7ppg, 5.1rpg and 3.8apg. He is a former Eurobasket Summer League player, which is considered top international summer league in the market. #3. Experienced Raymond Canady Jr. (6'7''-G/F-84, graduated '07, currently in Spain) was not able to secure a victory for Tormes (5-16) in their game against Azpeitia ISB (13-8) in the Spanish LEB Silver (third division). He scored 6 points and grabbed 6 rebounds in 23 minutes. The 12th-placed Tormes (5-16) was crushed 71-40 at home by the much higher-ranked (#3) Azpeitia ISB in the West group. It was Tormes' third consecutive loss in a row. Canady Jr.'s team will play only one more game in the Regular Season. And that game will be critical. This year Canady Jr. averages 5.0ppg and 3.8rpg in four games. Canady Jr. is a former Eurobasket Summer League player, which is considered top summer league for players who want to play basketball overseas. #4. 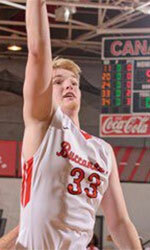 Jimmy Kodet (6'7''-F-95, graduated '18, plays pro in Germany) led Goldbach to a surprising victory over the fifth-ranked Herzogenaurach (10-8) 79-71 in the German Regionalliga (fourth division) last Saturday. Kodet was MVP of the game. He scored 31 points (!!! ), grabbed 9 rebounds and made 3 blocks; quite an impressive performance considering it's only Kodet's first season in pro basketball. TV Goldbach 1897 (4-13) is placed 14th in South-East group. This season Kodet has very high stats. He averages 19.5ppg, 7.3rpg, 1.8bpg and 1.5spg. #5. Jeremiah Hill (6'2''-G-95, graduated '17, plays in the NBA G League) led Lakeland Magic to a victory over the Maine Red Claws (13-22) crushing them 130-101 in the NBA G League on Tuesday night. Hill was MVP of the game. He recorded 30 points (!!!) and added 3 assists in 24 minutes; not bad, considering it's only Hill's second season in pro basketball. The Lakeland Magic has a solid 24-12 record this season. It was his team's fourth consecutive victory in a row. This year Hill averages 6.4ppg, 1.9rpg and 2.6apg in 29 games. Worth to mention he played also at Eurobasket Summer League, which helped him get the job in pro basketball.